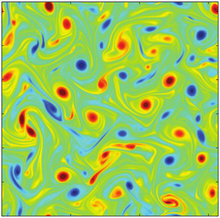 The strength of the nonlinearity is measured in decaying two-dimensional turbulence, by comparing its value to that found in a Gaussian field. It is shown how the nonlinearity drops following a two-step process. First a fast relaxation is observed on a timescale comparable to the time of formation of vortical structures, then at long times the nonlinearity relaxes further during the phase when the eddies merge to form the final dynamic state of decay. Both processes seem roughly independent of the value of the Reynolds number.